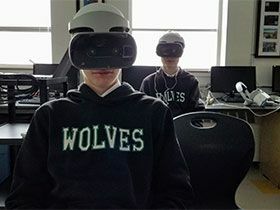 As part of a future-focused education, students at WPGA are exposed to a variety of current and emerging technologies. Students are given state-of-the-art tools and asked to think critically about the implications of these technologies for their lives as learners, as well as for the world as a whole. Recent examples of these are virtual and augmented reality (VR and AR). Students were invited to explore how these tools will change the way they learn and work into the future. For example, what are the positive and negative aspects of such technologies? What new possibilities do such innovations enable, and what are the other underlying technologies required to make AR/VR experiences possible? Within WPGA's computer science department, we support our students to become critical thinkers about technology, with a deep understanding of the implications for both their lives and the world.